Anyone living in or visiting Southern California this Thursday the 21st can come out to see it. 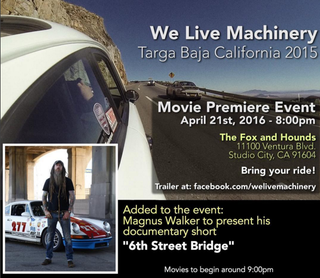 Also Magnus Walker will be present to present his short film “6th Street Bridge”. We Live Machinery: Targa Baja California 2015 - TRAILER from TMCA on Vimeo. So everyone bring out your cars and come see a couple of cool car films.